A Winthrop man charged in an alleged gay-bashing attack in Provincetown this weekend was described in his well-heeled, waterfront neighborhood yesterday as a "good kid." Eric Patten, who's slated to be arraigned on felony assault and hate crime charges today in Orleans District Court [for attacking two lesbians while spewing homophobic slurs and shoving one of them through a window], is a 23-year-old Boston College High School graduate known as a do-gooder among neighbors in his Winthrop enclave. "I was surprised. 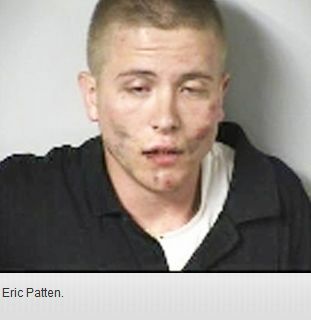 I just can't believe it," one neighbor said of the violent charges levied against Patten. "But alcohol is a crazy drug. It does crazy things to people." Sure. I lost track years ago of the number of times I've gotten drunk and committed a hate crime, because everyone knows that alcohol is magical bigotry juice that fills a person with prejudices they don't hold and even a mere hint of which they've never previously exhibited. The neighbor, who requested anonymity, said Patten, the son of a well-to-do family, is "the type of kid who would run across the street and help carry in the groceries." "He's a very good kid. Very respectful," the neighbor said. Seemed like a good kid. Seemed very respectful. I'm not sure how many times we, as a culture, are going to have to do the shock-that-a-good-white-boy*-could-do-a-bad-thing before we finally lay in its grave at long last the idea that a characteristic we privilege (including being a Christian) confers an inherent goodness upon the people who exhibit it. Decency is a choice—a choice we must make every day, every time we face a decision where there is opportunity to do the right thing or the wrong thing. One may be a Good Kid in one moment and not in the next; we all have the capacity to help carry groceries and we all have the capacity to throw someone through a window in hatred. There are no "Good Kids" who lack the facility to do terrible things—only kids whose privilege is presumed to render unnecessary the lessons of compassion that make the commission of terrible things vanishingly unlikely. We still haven't learned that the secret is expecting more. * I'm not identifying Patten as "straight," because I don't know for certain. He could be a closeted gay man reacting to internalized homophobia; or he could be a gay man (closeted or otherwise) expressing a hatred of lesbians, which is rare but does happen. In any case, I'm not going to guess about his sexual orientation; it's irrelevant to his victims and irrelevant to the hate crime designation, anyway.